JEJU ISLAND -- The two Koreas should be at the center of the denuclearization process, with the backing of the US and China, to resolve the decades-old nuclear standoff and establish a peace regime, a former American diplomat told a forum Wednesday. 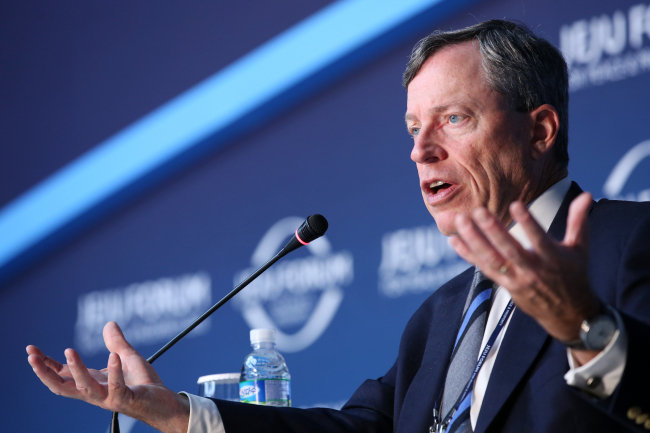 Zelikow was deputy to then-Secretary of State Condoleezza Rice from 2005 to 2007, when six-party talks among the Koreas, the US, China, Japan and Russia were underway to dismantle North Korea’s nuclear weapons program. Negotiations collapsed in 2008, with North Korea declaring the deal void after refusing inspections to verify compliance. He helped draft the US policy toward North Korea, which envisioned turning the armistice agreement into a formal peace treaty to end the 1950-53 Korean War. Whether it is about dismantlement of nuclear and missile weapons programs, or the withdrawal of US troops from South Korea, the countries should put all of them on the table and let diplomacy play out simultaneously on multiple fronts as the “step-by-step” approach has failed multiple times in the past, he said. “When you work on a narrow view of denuclearization track, it almost always turns into a step-by-step negotiation,” he said during Wednesday night’s session on a peace regime on the Korean Peninsula at the 13th Jeju Forum. “We are not used to broad, front diplomacy of open issues, with no preconditions, to talk about everything that concerns us, but that’s actually the state we are at now. It is the best way to get a denuclearization,” he said. His remarks come as North Korea and the US are facing a possibly long process of follow-up negotiations over dismantlement of the reclusive country’s nuclear and missile programs, after they held their first-ever summit on June 12 in Singapore. In the joint statement signed between US President Donald Trump and North Korean leader Kim Jong-un, North Korea committed to “complete denuclearization” of the Korean Peninsula, and the US promised to give a security guarantee to the North. Realistically, engagement of the US and China in the process could only prolong negotiations and the Koreas should lead future denuclearization talks, he said, with the US and China backing the process. “My own view actually is that South Korea should be at the center of any future negotiations process to ease tensions on the Korean Peninsula,” he said, calling it a two-plus-two strategy. But when it comes to dissolving the armistice agreement, which was signed at the end of the 1950-53 Korean War, and signing a peace treaty, the role of the US and China is essential as the countries are signatories to the armistice, he said. Zelikow stressed the involvement of China in particular. “I actually think it is in the US’ interest for China to engage,” he said, when asked about his views on declaring an end to the Korean War and signing a peace treaty.